The adivasis from Gujarat, affected by the Sardar Sarovar Project, have been on relay fast since July 15, 2016. On November 4 late evening, they changed their venue site. It has been shifted to in front of the Rehabilitation Development Office, at Kevadia Colony, near the dam site, with a dead body kept nearby. The dead body is of 80-years-old adivasi Duljibhai Bhil, who belongs to to the original village, Kadada, which got submerged land after the Narmada dam came up at Kevadia. It was situated the banks of Narmada. 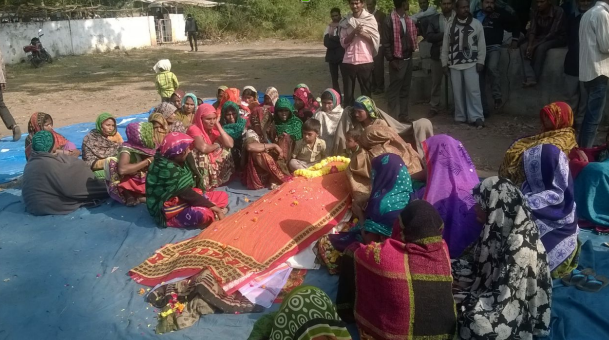 Duljibhai's death, say adivasis, can’t be called a natural death, since one must know how and why the death occurred. The death of Duljibhai suggests, in a way, why the old and young adivasi oustees are compelled to go for such a long agitation. His story is typically self-explanatory. Kadada is one of the 19 affected villages in the mountain ranges of Vindhyas, which had no electricity, no motor pump, no shop, and no school. Duljibhai belonged to the Bhil community, whose livelihood depended on forest produce, on one hand, and fish catch, on the other. There were a large number of families whose names were not in the official list of the oustees, and many of them, therefore, continued to live in the village Kadada itself, dispersed in various phalias (hamlets) of Kadada. Many others, shifted to rehabilitation sites (vasahats) with their fathers, haven’t yet received land, which they are supposed to get as part of rehabilitation package. Several old adivasis, who have failed to be rehabilitated, have passed through a long process of complaining before the Grievance Redressal Authority (GRA), chaired by retired judges. They have faced harassment and suffered heavily, but have not been redressed. Duljibhai had paternal land. After his father’s death, his mother and his three brothers and he became successors. The submergence of village Kadada in 1994 compelled the family to shift to the resettlement and rehabilitation (R&R) site, Amroli, in 2007, where three brothers got government-allotted land. But Duljibhai was, strangely, left out. He lodged his complaint to GRA in 2002. The GRA of Gujarat forwarded the complaint to the Saradar Sarovar Rehabilitation Agency, but there was no positive response. At Amroli, his two elder brothers, Bhaglabhai and Bhuljibhai, and younger brother Rumalya , got land, 5 acres each. However, this was not adequate. Yet, they cultivated their plots.. Duljibhai and his family, on the other hand, was left with no source of livelihood, nor housing plot. In 2003, as per village records, Dhuljibhhai's family had five major sons. Had Duljibhai been declared an oustee, at least few of them could have been declared as project affected and received R&R benefits. But this did not happen. Duljibhai submitted complaint to GRA again, stating all this, providing all village documents, endorsed by the village chief, in 2003. However, he received a letter from GRA rejecting his claim just a few days ago. Already 80, in a state of shock, he died. The family of Dhulajibhai, including women and children, have been agitating for land for long. Earlier, a year ago, they sat outside a Narmada office in Naswadi town about a year ago. However, on a promise of the deputy tehsildar that the government would inquire into their problem, they ended their fast. Yet, nothing happened. Seeking their right to land, the family members participated in the recent relay fast, which began on July 15. Dhuljibhai’s story brings out the way in which the Sardar Sarovar-affected adivasis are facing torture in Gujarat. The adivasis sitting with dead body of Duljibhai Bhil are demanding reply to all their demands and those of Duljibhai.